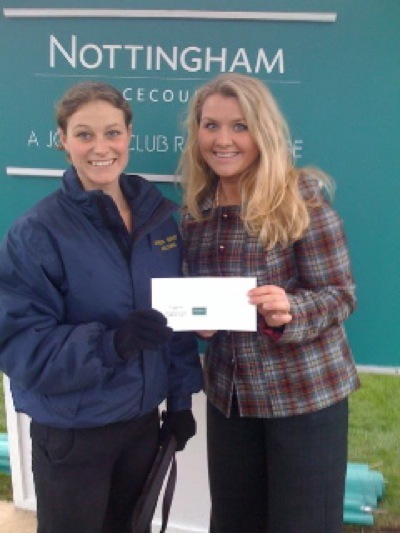 It was no coincidence that Ginny Hull, Marketing Executive of Sawfish Software, picked out James Given’s Dream of Olwyn in the paddock for the best turned out prize today at Nottingham for the Sawfish Software Ladies Series finale. The filly was clearly feeling well and always travelling to give a dream ride to Serena Brotherton (shown above after passing the post), taking it up as they turned into the home straight and maintaining her gallop to scorch home clear of the remainder. This win gave Serena valuable points in Steve Hull’s Sawfish Software Series, but not enough to deny Alyson Deniel retaining her lead to take home the series trophy. Many congratulations to Alyson and to Serena, and a huge thank you to Steve Hull and Sawfish Software for such an exciting end to the season for the ladies with this series now having completed its second year. Only one race now remains for this season, that being a mixed race at Musselburgh on 7th November. 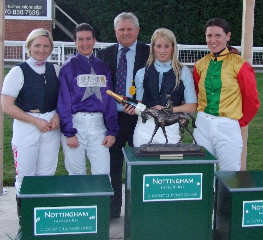 Sawfish Software Series 2007 saw a tie in the final results between Serena Brotherton (2nd left) and Faye Bramley (right) seen here at Nottingham receiving their prizes from sponsor Steve Hull together with placed riders Amy Ryan (2nd right) and Carol Bartley (left). GOOD LUCK TO ALL OF OUR LADY RIDERS!!! SERENA BLAZES A TRAIL TO MAKE THE BATHWICK TYRES LADIES SERIES HER OWN! 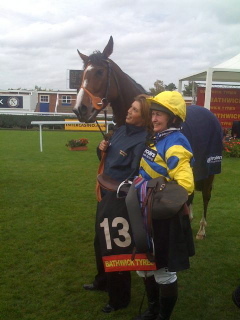 MANY CONGRATULATIONS to Serena Brotherton on claiming the Bathwick Tyres Ladies Series 2008 so decisively today at Newbury by winning the finale in this year’s series of 8 races with ease for Alan King on his top class staying hurdler Blazing Bailey. By this stage in the series, which began back in early May at Salisbury, the winner of the series was down to three top class lady amateur jockeys (pictured here before today’s race) – Gemma Gracey Davison (24 points), Emily Jones (22 points) and Serena Brotherton (27 points). A totting up of the points after today’s race was hardly necessary, with Blazing Bailey always handy and quickening when asked to win with ease. 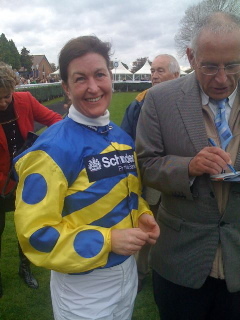 Serena can now look forward to the coveted prize of a holiday of a lifetime, thanks to the generosity and loyal support of Wayne and Sarah Clifford of Bathwick Tyres and we thank them enormously for their fantastic series which has again given some great racing experiences to our lady amateur jockeys and also of course given so much pleasure to us all. DANNY MAKES IT 3 WINS IN 3 DAY AND 1500 MILES! 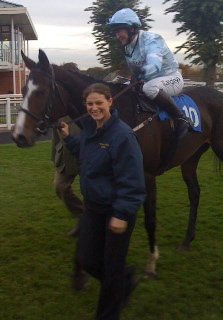 Congratulations to Danny Cook on following up his wins at Ludlow (AJA chase) on Thursday and at Baden-Baden on the Flat yesterday (on an outsider by a nose, where he was recognised as Fegentri World Champion runner-up to Donal Macauley of Ireland) with making it a hat trick by winning the seller at Stratford-upon-Avon this afternoon in spite of severe sleep deprivation!! Today’s selling hurdle produced an exciting finish with five in line coming to the second last and when asked, Star Tenor was able to quicken away for Danny to lead past the post. Many thanks to Danny for being such an excellent Fegentri representative for Great Britain this year.Meanwhile, Gemma Gracey-Davison currently holds third place in the ladies Fegentri tables and travels to Seville next weekend for the penultimate ladies race meeting before looking forward to the final two ladies races in Mauritius in early December. With the rapidly approaching end of the Flat season looming, the outcome of the battle for the Bathwick Tyres Ladies Championship Series Winner will be decided tomorrow at Newbury. Current leader Serena Brotherton (27 points), Gemma Gracey-Davison (24 points) and Emily Jones (22 points) are the only ladies in with a chance as their nearest rival Amy Ryan, 4th in the tables on 17 points, could not beat Serena on points as a win earns only 8 points.Meanwhile both the lady and gentleman amateur champion Flat jockeys’ championships are reaching their conclusions. Simon Walker leads the gentlemen (4 wins) with his nearest rival Joshua Moore (3). One (mixed) race remains for them at Musselburgh on 7th November when the ladies will also meet, having enjoyed a further 3 ladies races with Doncaster this afternoon (AJA race), Newbury tomorrow (Bathwick series final) and Nottingham next Wednesday (final of Sawfish Software series). The ladies are currently led by Amy Ryan (6 wins) with Alyson Deniel and Emily Jones (4 wins each), Jacqueline Coward (3 wins) and Serena Brotherton and Rachel Kneller (2 wins each).GOOD LUCK TO EVERYONE!!!!! ROB KIRK, amateur jockey with Venetia Williams, will be out of action for two months following a fall from a young horse at the yard this morning and is being treated in Hereford General Hospital. Rob rode winners at Cheltenham and Kempton last season and has broken his lower right arm, dislocated the elbow and also damaged the shoulder. 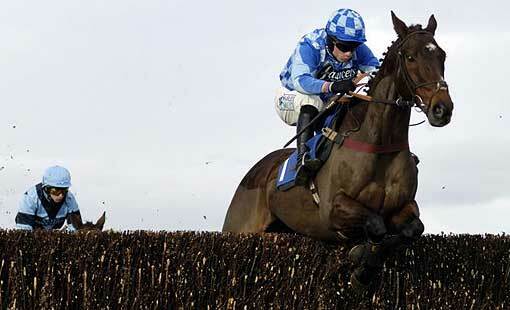 We all wish him a speedy recovery and swift return to the saddle. Congratulations Danny Cook – 2 winners within 24 hours 700 miles apart! Congratulations to Danny Cook on winning the AJA Amateur Riders’ Chase at Ludlow yesterday before flying out to Baden-Baden for the final day of the gentlemen’s series, where he has just won on the Flat, taking him into runner-up slot for the Fegentri Flat World Championship 2008. The Amateur Club of Madagascar is organising an International Race on 16th November 2008 and wants to invite lady and/or gentlemen riders. As this race is outside the Fegentri championship, riders are asked to PAY THEIR OWN AIR FARES but accommodation and transport in Madagascar will be provided free of charge. For specialist advice on best flight ticket prices, please contact our newly appointed AJA travel counsellor Catherine Thorburn on catherine.thorburn@travelcounsellors.com or give her a call on 0845 058 7562. Riders must have ridden a minimum of 5 winners either under Rules, point-to-points or Arab racing; girls must weigh around 9 stone and lads around 10 stone. Ø Invited riders: 2 riders per country is possible; lady and/or gentlemen riders. Ø They will have one ride (if the riders want to have 2 rides, they have to arrive in Madagascar before November 9th, so that they can ride for the first time on 9th November, second ride on 16th November 2008. Departure can be on Monday, November 17th at the earliest. Riders arriving on 7th can organise a tourist programme. The host would be pleased to drive them to the seaside. Ø Weights: as the local horses are quite small they prefer to have riders who can do the weight between 58 – 67 kg (9 stone to 10 stone 7 lbs). PLEASE NOTE: As Madagascar is not within the recognised Turf Authorities covered by the BHA insurance policy, riders are advised to take out their own insurance for race riding as NO INSURANCE is included within this invitation, although you are insured for riding out if a member of the AJA. This is an amazing place to race ride. 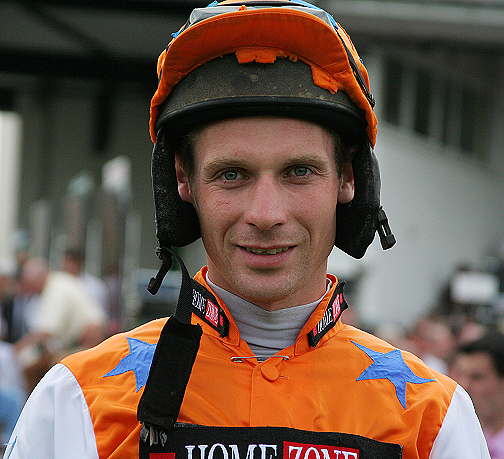 Past jockeys from the UK have included David Dunsdon, Dr Philip Pritchard and David Turner. Please call the AJA if you are interested or have any queries! Replies please by OCTOBER 23rd if possible. Thanx.